HEAnet’s data centre hosting service facilitates clients who wish to install equipment in a fully managed data centre environment. The service is run on a not-for-profit basis. HEAnet runs data centres in Dublin (Blanchardstown and Parkwest) and Waterford. For higher power hosting requirements we have 10kW cabinets in Blanchardstown and 10kW, 15kW and 30kW cabinets in Waterford. Connectivity including Resilient Ethernet Links – 1Gbps included as standard (10Gbps also available). For an additional cost, HEAnet can spec and procure servers on behalf of the client. We can also install and manage an Ubuntu Linux operating system. Our standard (3.5kW) Data Centre Hosting including power and cooling – is charged annually, in advance, to facilitate budget planning. Hosting of a full 3.5kW cabinet in Blanchardstown or Parkwest is €12,000 p.a. (ex VAT). Pro-rata rates for 1⁄4, 1⁄2, 3⁄4 allotments are also available. Electricity for high-powered cabinets is metered per cab and charged quarterly in arrears, based on usage. HEAnet’s system has worked so reliably. We have virtually no down-time. It was a no-brainer (choosing HEAnet)…it had to be resilient, and good enough that the download speeds wouldn’t be an issue for users…the data amount we have stored is always growing. The (HEAnet staff) are good and are all very knowledgeable. I find them very good to deal with – straight-talking. Without the (data centre) Remote Hands and Eyes, I wouldn’t get certain equipment notifications, so from that point of view they’re invaluable to us. Support and information on HEAnet’s Data Centre Hosting service is available through the HEAnet NOC. 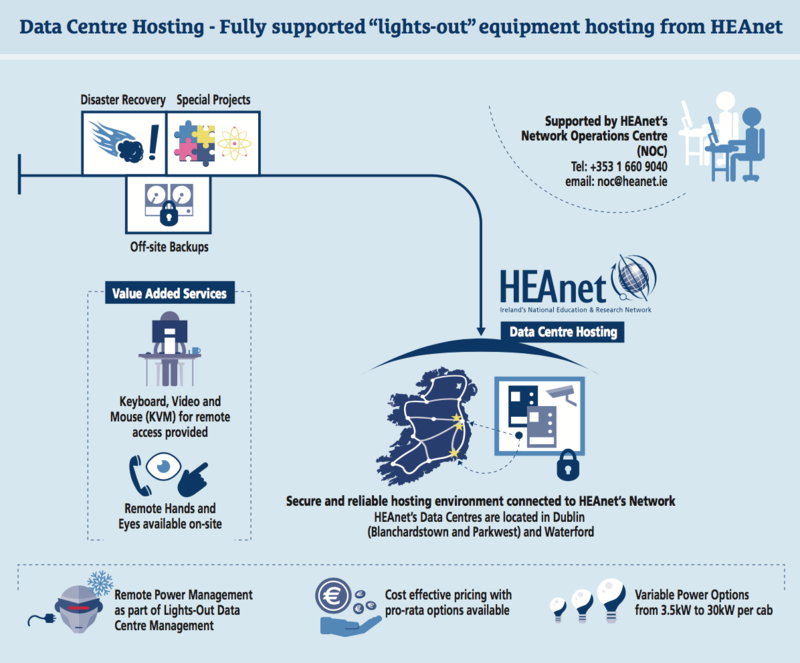 You can contact HEAnet’s Network Operations Centre (NOC) by emailing noc@heanet.ie or by calling 01-660 9040. The NOC hours of operation are Monday to Friday, 9:00 – 17:30. The NOC is committed to ensuring every client receives a consistent, responsive service with an emphasis on minimising client disruption.